Basements that are not musty and more energy efficient are very possible. When considering basement remodeling, you have a real chance to elemenate the “old cellar” basement smell and the damp, spider filled living spaces that haunted ygrandparents house back when you where just a kid. Your basement can be a comfortable, odor-free space. And at the same time, it can help lower your heating and cooling bills. Eliminating the musty, damp smell is done by making sure you are building a basement that is waterproof. In addition to that, the walls of the basement should all be covered with insulation. On warm, humid days, condensation can form on cool surfaces in your basement. This adds moisture and can even contribute to mold growth. 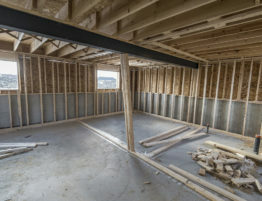 By insulating the basement walls, you keep the humid air from reaching the walls and prevent condensation from forming. The air in the basement will stay dry and not smell damp. Because basements are primarily underground, they are not subject to high summer temperatures and low winter temperatures. The constant temperature of the earth around a basement tends to make the temperature within the basement more stable. It’s never too hot or too cold. You can use your basement as a heat sink by circulating that temperate air throughout your house. It will contribute to cooling your house in summer by absorbing heat from the upstairs air. And it can help heat your house in winter since it is already partially heated by the earth around it. And by mixing the house air through the basement, the quality of the basement air will match the air in the rest of the house and the basement will not smell musty.